Bake quiches as directed on package. Meanwhile, prepare ingredients for toppers. 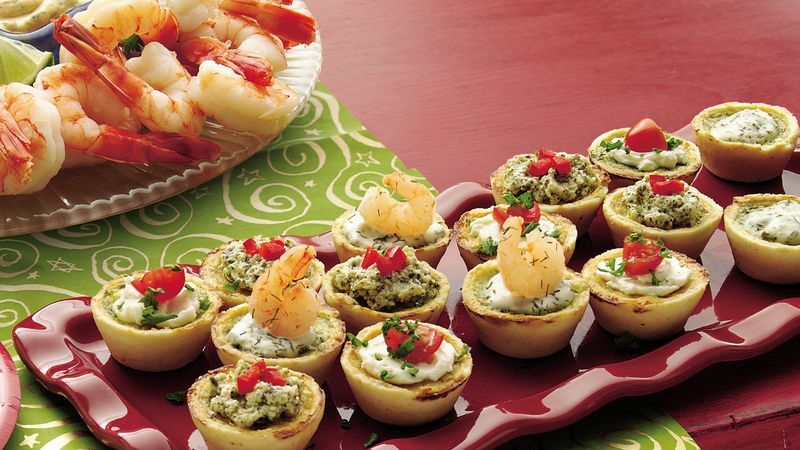 For Creamy Pesto Topper, mix cream cheese and pesto; spoon about 3/4 teaspoon onto each of 16 quiches. Garnish each with bell pepper. For Red and Green Topper, spoon about 1/2 teaspoon cream cheese spread onto each of 16 quiches; place 1 tomato quarter in center of each. Garnish each with parsley. For Dill-Shrimp Topper, spread about 1 teaspoon dill dip on each of 16 quiches; place shrimp with tail end facing upward in center of each. Sprinkle with dill, if desired. If you don't want to make all three toppers, simply choose any topper and double or triple the ingredient amounts depending on how many you plan to make.